Bike-fixing workshops, zumba classes, chalk on sidewalks, raffles, helmet-decoration sessions, yoga classes, bike tattoos, free coffee, information stands for local nonprofit groups, a climbing wall, jump-ropes…the list goes on and on. These are some of the free activities that locals will be able to enjoy at the Open Streets Carrboro on Saturday, April 13. Stephan Grabner, junior, Philosophy Major, is one of the many locals that enjoy the first days of Spring biking on one of the several biking lanes spread throughout Carrboro. In 2011, Carrboro became one of two cities in the southeast to receive a silver level status as a Bicycle Friendly City from The League of American Bicyclist organization. (Staff photo by Faima Ramirez). After a January unanimous vote of approval from Carrboro Board of Aldermen, the town will close one of its main streets to cars and open it to bikes and pedestrians for half a day. 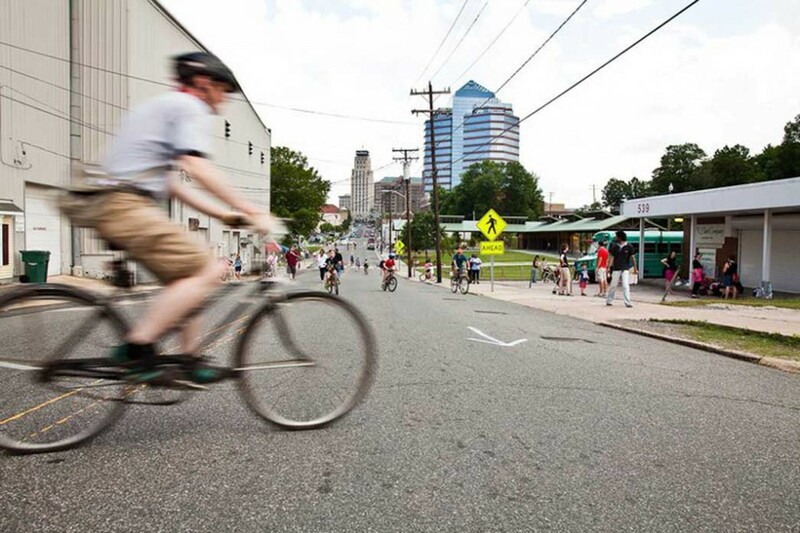 West Weaver Street between North Greensboro Street and Elm Street will host the first Ciclovía or “open streets” event in Carrboro Saturday between 9 a.m. and 3 p.m. Additionally, some activities will be held on the loop between Oak Avenue, Lindsay Street and East Poplar Avenue. In July 2012, the Carrboro Bicycle Coalition won a Better Bicycling Community Grant from Performance Bicycle, for the sole purpose of conducting an open streets event. Allman explains that open street events started as an effort to improve the community by giving people a space where they could get together and partake in activities. Every Sunday and holiday, up to two million people in Bogotá converge on a 70 mile stretch of road free of cars where they are able to bike, run, walk and enjoy life. The initiative picked up in the United States in the last decade and now cities like Chicago and San Francisco have weekly “open streets” events. Closer by, Durham has hosted two of these events. Michelle Johnson, who has been on Carrboro’s Board of Aldermen for a year, said she is very excited about the first Open Streets Event in Carrboro. “When The Bicycle Coalition of Carrboro proposed the event at a first meeting, I said right away ‘I want to teach yoga’,” Johnson said. 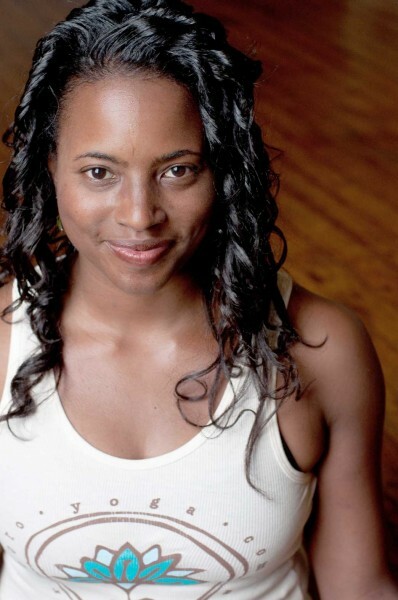 Johnson will teach an all levels adult yoga class Saturday, April 13, the day of the event outside of her office on W. Weaver St. close to the Venable building. (Photo courtesy of Heba Salama Photography). The Carrboro Bicycle coalition is a non-profit group created four years ago as a response to Carrboro’s Bicycle Master Plan to improve its bicycle infrastructure. In 2011, Carrboro became one of two cities in the southeast to receive a silver level status as a Bicycle Friendly City from The League of American Bicyclist organization. “The board is very excited about the event,” Michelle Johnson, member of the Carrboro Board of Aldermen said. Three of six aldermen council members on Carrboro’s board are volunteering at the Open Streets event. Johnson will teach a yoga lesson and Jacquelyn M. Gist and Damon Seils will help in some capacity, Allman said. The coalition intends to provide the Town of Carrboro with the $3,000 grant in order to cover costs associated with closing West Weaver Street. Johnson explains that the high costs of closing streets in town are associated with placing barricades and staffing additional people to redirect traffic and for people’s security. According to its website, the Town of Carrboro requires a public hearing for all street closing permit applications. According to Allman and Johnson, many Carrboro citizens favored the initiative at a public hearing held on Jan. 29. The only concerns involved logistics, including deciding which day of the weekend to host the event, which side of the street to close to traffic and how to overlap it with the Carrboro Farmers’ Market. “We talked to the managers of the farmers’ market and they actually wanted it on Saturday because they thought it may benefit them,” Allman said. The activities are set up so that people walk down West Weaver Street towards the Carrboro Town Commons where the market is located. Johnson said that the coalition approached most of the local businesses downtown to hear their concerns about the event. Weaver Street Market will provide food for a bike-powered smoothie-maker and the ReCYCLEry Collective will help people repair their bikes. “We really tried to include something for everybody. We don’t have a specific group in mind,” Allman said. The inaugural 2011 Bull City Open Streets took place as a part of the Durham Earth Day Festival celebrations on Sunday May 1st from 12 p.m. until 3 p.m. The event, which has been repeated in several occasions since, takes place on the streets around the Durham Farmer’s Market and Durham Central Park. Over 1,100 Durham residents came out to play, walk, run, bike and dance. This Saturday, April 13 from 10 a.m. to 3p.m. Carrboro will have the first Open Streets Event of its own. (Photo courtesy of Bull City Open Streets Facebook page). Organizers have adopted many strategies for promoting this event. They have employed the use of social media, word of mouth, and fliers hung up at churches, community centers, tiendas and apartment complexes. The town’s report on the event says that between 500 and 800 people are expected to attend the event in addition to more than 45 volunteers that have signed up to work on either of the two shifts. “They have been mindful to have a diverse group of folks involved in this event,” Johnson said. Maria Hitt, coordinator of the Carrboro Growing Healthy Kids Gardens, said she thinks the event is a great idea but that it’s always challenging to bring all sectors of the community together. “The town has to figure out how to make these events attractive and welcoming to the Latino, Burmese, Korean and African-American low-income communities,” Hitt said. Hitt suggests that the organizers advertise in different languages and engage these populations in the planning. She said some of the younger Hispanic boys have a great interest in music and allowing them to DJ at the event would help make them feel included. Hitt says that in her experience at the gardens, it has been relatively easy to get the Latino and Korean residents excited about community events. However, she said she’s had problems making African-American families feel welcomed. “There is a lot of misunderstanding. Racism goes in all directions,” she said. Hitt argues that language barriers and cultural prejudices between Hispanics and African American make it difficult to get them to talk to each other. “I think this event is an opportunity for residents to come out and meet their neighbors and sharing space,” Johnson said. 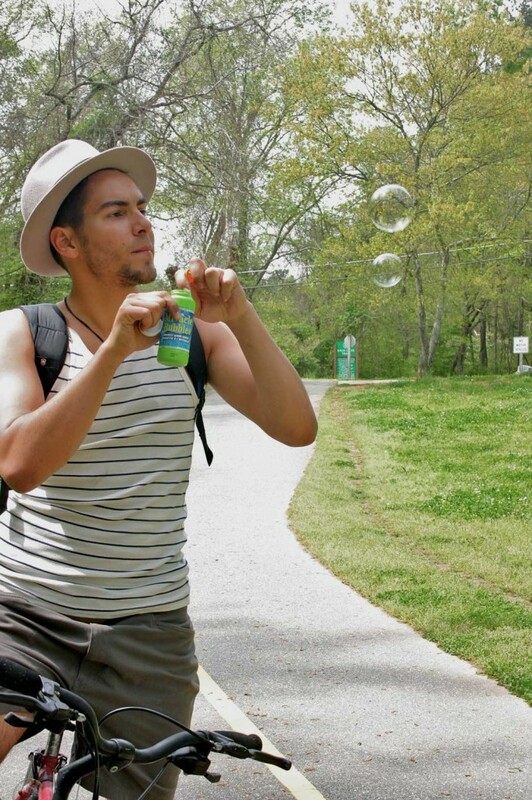 Allman says that he hopes that Open Streets Carrboro will help create an experience that will become a regular event that encourages an active and healthy lifestyle for the entire community. This is great, I wish I had seen this before Saturday and I might have gone. Also, I love the picture with the bike and the bubbles!